Heatstroke is a severe condition in which the body can not cool itself via perspiration and, as such, becomes overheated. Heatstroke, or sunstroke, tends to start out as heat exhaustion or heat cramp. However, if the heat cramp or heat exhaustion is not treated or controlled in time, it could exacerbate to heat stroke. Heatstroke can be fatal if not treated or controlled promptly. It could also lead to brain damage or damage to other vital organs. As such, one should always seek professional medical help if experiencing heatstroke. Heatstroke is more common in hot and humid environments. Dehydration and strenuous activity or exertion can trigger heatstroke. Other factors that could contribute to heatstroke include; wearing thick clothes, consumption of alcohol, cardiovascular disease, and sweat gland dysfunction. The major symptom of heatstroke is a rapid increase in body temperature. 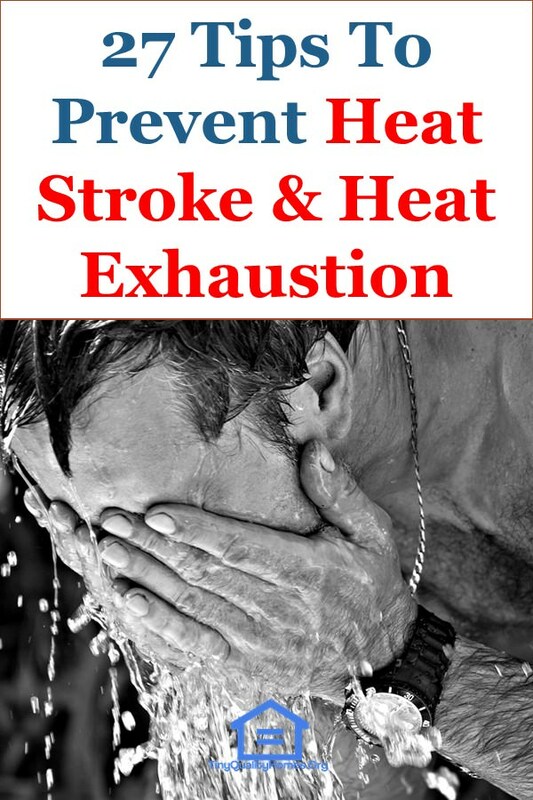 Other symptoms of heatstroke include; a headache, dizziness, fatigue, decreased perspiration, nausea/vomiting, loss of consciousness, difficulty breathing, flushed skin, and muscle cramps or weakness. When it’s too hot outside, you want to dress in clothes that will allow your skin to breathe, but at the same time, you want to protect yourself from direct exposure to the sun’s rays. As a result, opt for lightweight outfits that come in lighter shades and offer a loose fit so that your body can cool off. At the same time, wear sunglasses and wide-brimmed hats or simply cover yourself with a scarf or an umbrella. The sun is hottest during the hours between 10 am and 4 pm. UV rays are also most harmful during these periods. To prevent exposure, therefore, avoid being out during this time. If you truly must be exposed to the sun during these periods, make sure you put on sufficient sunscreen and protective clothing such as a hat. In addition, spend as much time as you can in the shade and remember to take in plenty of water. Sunscreen should be used daily, even when it’s cloudy or rainy. This is because even in the absence of heat, harmful UV rays are always present and can be just as harmful on a rainy day as they can be on a sunny day. When choosing a sunscreen, go for one with an SPF of 30 or higher and apply it generously all over your body paying special attention to areas that can easily be neglected such as the ears. Remember to reapply sunscreen every few hours especially when you will be spending the better part of your day outdoors. When it’s too hot outside, aim to lower your body’s temperature by taking cold showers or baths. However, do not do this as soon as you come in from outside. Rest for a while to allow your body to transition to the lower indoor temperatures then take your shower. Sudden temperature change can be just as bad as overexposure to the hot sun. If it is not possible to take a shower, spritzing cool water on your skin will be just as soothing. Ingestion of some foods has shown to be effective when it comes to keeping the body cool and preventing potential heat stroke. These natural home remedies are; coconut water; juices of coriander or basil leaves, onions, particularly in raw form, drinks made from the pulp of raw mangoes. Needless to say, you have to drink lots of water on hot summer days because the body would be losing water much faster through sweating which is necessary for cooling your body. Besides drinking water, milk is also a good fluid to keep you hydrated. Just remember that cool drinks are better than very cold drinks because the latter could lead to stomach cramps. Increased consumption of liquids will not necessarily suit everyone though. People suffering from heart or liver diseases and epilepsy should first consult their doctor. The same applies to those who might be on a fluid-restricted diet. Besides water, you should also take drinks such as buttermilk and coconut water which are rich in electrolytes. The same also applies to sports drinks such as Gatorade or Powerade. The idea behind drinking beverages rich in electrolytes is because as you sweat, the body loses a lot of sodium and potassium that need replenishing. Therefore, besides just staying hydrated, you would also be making sure your mineral levels are in check. When your body has low levels of electrolytes, you will not be able to sweat, meaning you will not be able to lower your body temperature naturally. A healthy diet is vital for a healthy body and helps you survive the summer time without heat exhaustion or other health issues. To this effect pay particular attention to; • Consuming soups, broths, and cereals to stay hydrated. • Eating more fruits and vegetables especially those that are high in water content and vitamin C levels. • Take foods that are easily digestible such as yogurt. • Consuming many light meals as opposed to fewer heavy meals. • Avoiding fatty, spicy, and fried foods. As you indulge in less strenuous exercise in the summer, you should also indulge in less strenuous activities in general, and this includes outdoor work too. During the summer, take shorter strides, handle easier tasks and just generally work slower than you normally would so as to prevent overworking your body and making it susceptible to heat exhaustion. Besides taking it easy, remember to take frequent breaks ideally in a shaded area. In the absence of air conditioning, you can use fans to cool yourself. An electric fan could come in handy for your home or office but even when you are outdoors, constantly fan yourself using a magazine, hat, handheld fan, etc. During your breaks, allow yourself to rest while lying down. This would give your body time to adjust back to its normal temperature, and it would also give your muscles time to relax completely. Ideally, it is advised you lie down with your feet slightly elevated seeing as this promotes venous return. If you do not want to experience the harsh effects of a hot summer, you have to train your body to get used to the hot sun gradually through acclimatizing. How can this be done? After spending much time in the sun, rest under a shade for a while before walking into an air-conditioned space. Conversely, after sitting in an air-conditioned room for quite some time, move to a shade and stay there a while before going out into the hot sun. These gradual transitions are meant to give your body the chance to prepare to handle the drastic temperature changes. When a car is parked under direct sunlight on a hot day, it gets very hot very fast, both the exterior and the interior. Furthermore, oxygen levels could drop dangerously low to the point of causing unconsciousness and potential death. So what are the dos and don’ts concerning parking your car during very hot weather? • Park in a shaded place. • Don’t leave elderly people, children or pets in the parked car. • When sitting in the car, either have the air conditioner on or the windows open all the way. • Avoid taking naps inside the parked car. During the day, it is advisable you close the sun-facing windows in your home so as to minimize your exposure to the sun’s UV rays. You can open these windows during the night when temperatures have dropped. Of course, this would mostly apply to those who spend a lot of time during the day in sun-facing rooms with sun-facing windows. If you are unable to or do not want to close your sun-facing windows for various reasons, consider pulling the shades over your windows. Curtains and shades would not only block out the sun’s rays, but they would also reduce the temperatures in the room. This would particularly apply when you have infants and small children who spend most of the day indoors. Choose curtains that come in lighter shades as opposed to those of darker colors because the latter would absorb heat. For the same reason, you should also avoid metal blinds. The best way to prevent heat exhaustion is by identifying and curbing the symptoms as soon as they occur. Some of the heat exhaustion symptoms to look out for include: •A sudden increase in body temperature. • A rapid pulse rate • Flushed/ red and hot skin. • A throbbing headache. • High fever. • Nausea and vomiting. • Weakness and fatigue. • Dizziness. • Decreased perspiration. • Muscle cramps. • Difficulty breathing. Each symptom can be put in check easily, but if you experience them for an extended period of time (more than a week), immediately seek medical attention. Dehydration is a process that occurs gradually over a period of time. To ensure that this is not happening, check your weight daily and ensure that you are taking in as much fluid as you are sweating. This should particularly be done before and after your workout sessions. Ideally, your weight should remain constant and you ought to start worrying if you register a significantly higher or lower value. Besides your weight, the color of your urine could be another indication of whether or not you are dehydrated. Healthy urine of a well-hydrated person should be light in color. Dark-colored urine could likely indicate dehydration. Engaging in strenuous exercises during the summer time would increase your body temperature thus increasing your chances of heat exhaustion. So how should you exercise during the summer to ensure you stay fit and healthy while at the same time taking measures to avoid spiking your body temperature too high? • Work out in an air-conditioned space. • Consume sufficient fluids before and after your exercise session. • Take regular breaks during your session. • Schedule outdoor walks and jogs for cooler times of the day. • Don’t play outdoor sports during the peak sun hours. You should be particularly mindful of your alcohol consumption in hot and humid climates. This is because when taken in large amounts, alcohol would not only blur your ability to judge temperature levels accurately, but it would also lead to dehydration owing to the fact that it is a diuretic. If you really must drink in the summer, do so responsibly by hydrating with water in between sips of alcohol. Just like alcohol, caffeine also speeds up dehydration. This way you end up sweating more than normal and losing water that is much needed by your body. If you truly need a pick-me-up, go for healthier options such as chia seeds, oatmeal, leafy greens, eggs, peppermint, etc. If there is too much sugar in your blood, your kidneys would, in turn, produce more urine in an attempt to eliminate the sugar. This reduces the amount of fluid being retained by your body and can easily lead to dehydration. Keep this in mind even while taking fruit juices to stay hydrated. If you take in too much salt, the body would use up too much fluid to digest it. This way, a lot of water is kept in the stomach leaving less fluid available for the production of sweat. If your body isn’t sweating enough during hot weather, your body temperature tends to remain quite high which can easily lead to heat exhaustion. Smoking leads to constricted blood vessels meaning your heart would be struggling to pump blood effectively to other parts of the body. Inefficient blood circulation leads to an improper distribution of heat which in turn impairs sweating. We are more prone to radiant heat exposure when we have our shirts off, thus, exposing our bare chests. Therefore, no matter how warm it may be, avoid going shirtless and instead opt for lightweight clothing. Weather forecasts can at times be inaccurate, but the predictions are normally accurate when it comes to predicting heat and humidity during the summertime. As a result, always plan your activities around weather forecasts so that you do not end up scheduling strenuous outdoor activity during a period that’s predicted to be extremely hot.